India's overall financial outlay in the national budget offers some instructive insights about the constraints and the opportunities in which national security, in its most comprehensive definition, is pursued at the policy level.A brief comparison with the allocation announced on February 1 by Finance Minister Arun Jaitley illuminates certain trends, particularly the steady increase in the revenue/manpower costs and the resultant shrinkage of funds available for modernising the inventory of the Indian military. The budgeted estimate for 2018-19 for defence is pegged at Rs 2,95,511 crore ($46 billion) (for the armed forces, the DRDO and the defence production units) and a separate allocation of Rs 1,08,853 crore has been made for defence pensions. The disaggregation points to an increase in the revenue component (standing costs for a one million-plus military) which for the current fiscal is Rs 1,95,947 crore, while the capital expenditure (for acquisition/modernisation of inventory) has a provision of Rs 99,564 crore. The fact that the overall pension bill in 2018-19 (which includes retired uniformed and civilian personnel) is now greater than the capital outlay is illustrative of the constraints of competing sector-wise allocation of a shrinking defence pie in the larger national context. To its credit, the Modi government has maintained the sanctity of the pension commitment for all government employees so entitled; and while certain inequities are yet to be resolved for the military pensioner, the number of uniformed veterans will increase annually and this allocation will have to be accorded its own fiscal autonomy. The total defence allocation minus pensions now works out to 1.58 percent of estimated GDP for 2018-19 and this is the second trend that is noteworthy. Over the last decade, from 2009-10 to 2017-18, the defence allocation as a percentage of GDP has declined from 2.19 to 1.65 percent. This now stands at 1.58 percent. It appears that successive governments have come to a determination that defence allocation can be gradually reduced without adverse impact on the national interest. Consequently, the fiscal support to the training, modernisation and inventory-acquisition of the armed forces will become even more constrained due to fiscal pressure and the fallout of this be felt on the operational profile of the Indian military. The comparison with the previous year's allocation sheds more light on the national security dilemma for India. In the last budget presented in February 2017, the Finance Minister allocated Rs 2,42,403 crore for defence in the fiscal 2017-18. With the pension amount added, this total went up to Rs 3,59,854 crore for defence alone. The comparable figure for this year, fiscal 2018-19, is Rs.4,04,364 crore ($63 billion). This is not an insignificant amount in a country where poverty is stark and millions live below or hover near the subsistence level. However, many anomalies abound as far as the Indian security profile is concerned. For a nation that can legitimately take pride in its indigenous capability at the macro end of the spectrum (nuclear weapons, missiles, nuclear submarines and satellites), it is woefully deficient at the middle and lower end of the military inventory spectrum. The just-concluded Republic Day parade on January 26 illustrated this in a vivid manner. Most of the platforms and ordnance delivering guns are of foreign origin -- from Russia in the main. The majority of India's tanks, ships and fighter aircraft are of ex-Soviet (now Russian) design and while some have been assembled in India, the reality is that India is yet to acquire the appropriate levels of design and manufacture even for basic inventory like personal weapons (rifles and pistols) and artillery guns. In similar vein, India has been pursuing fighter aircraft and helicopters with limited success. The Indian LCA (light combat aircraft) Tejas has been a work in progress for decades and while the first flight took place in January 2001, the aircraft is yet to be proven in a manner that will meet all the requirements of the users. There are some encouraging signs and one success story was on display at the parade -- the Rudra helicopter. Envisaged as an attack helicopter, it is derived from the Dhruv and was proudly showcased. However, this chopper is still a work in progress and needs to be pursued diligently to meet all the specifications initially outlined. 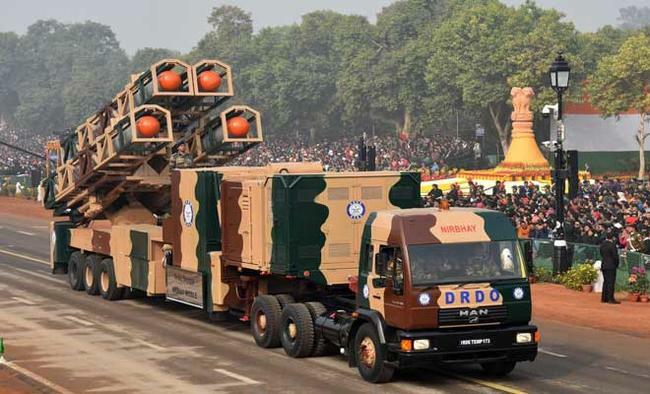 The opportunity that lies ahead is the possibility of India slowly acquiring a degree of credibility in designing and manufacturing conventional military equipment at the middle and lower end of the spectrum. Many developing nations have evinced interest in the Indian helicopters and some were exported to Latin America -- but the satisfaction level has been below the median. The just-concluded India-ASEAN summit had some expansive references to security partnership and the maritime domain received considerable focus. India has been seen as a net security provider in the Indian Ocean and various partnerships that add to the common good at sea have been mooted. But all of this will be predicated on the material status of the Indian Navy and Coast Guard and, to cite but one example, the helicopter is the little noticed work-horse for many operational exigencies -- but the helicopter fleet is grossly below what is the bare minimum number required for all the armed forces. Over the next decade, based on current trends, India will allocate up to $900 billion for national security and, of this, upwards of $200 billion will be spent in acquisition and modernisation of military capacity. The twin focus will be on 'Make in India' and redressing inventory gaps. Innovative partnerships that build on niche capability among India's bilateral partners needs to be explored in an innovative and effective manner.Funding for defence will remain a constraint, but nurturing an indigenous-technology driven policy focus and enabling the private sector is the need for ensuring the appropriate index of comprehensive national security.